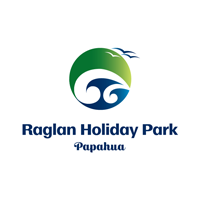 In true Raglan spirit, our Raglan Holiday Park is a friendly and relaxed family camping ground. You will enjoy the space, peace and tranquility of our holiday park and the range of Raglan accommodation we have to offer. With tent and caravan sites, backpacker, motel and cabin options, there is an accommodation option for everyone. The convenient location of our Raglan accommodation will put you right amongst all that there is to see and do in Raglan. A 2 minute walk has you on the beach, and a 5 minute stroll across the bridge and you are in the centre of Raglan town. Popular among light aircraft pilots looking for a fun weekend jaunt, our Raglan camping ground is situated beside the local grass airstrip. Park your plane adjacent your Raglan accommodation and walk into town for a coffee and a tasty meal at one of Raglan’s great restaurants or cafes. Come and discover Raglan fishing, surfing, sun and fun for yourself! As Seen on TV! Click here to watch us on "What's Up Down Under".